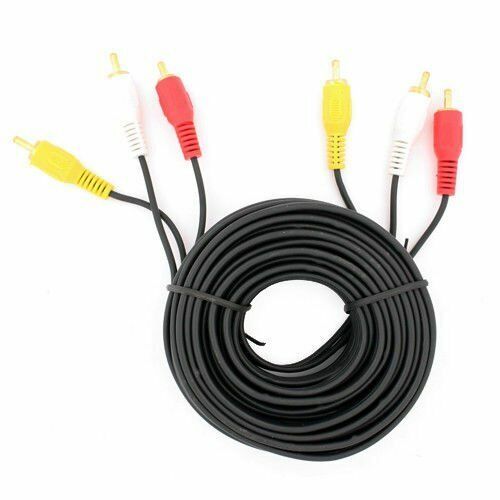 eBay 25 FT Premium 3 RCA Gold Plated Composite Extension Audio Video AV Cable Specifications: Color:GreyLength:25 FeetConnector:RCA Male to MaleQty:1 Payment: Shipping: Standard US*: Free Shipping Expedited US*: $0.99 each item Canada: Coming Soon International: Not Available *Delivery address must be verificable and deliverable by USPS. Package(s) undeliverable by the carrier will be deducted a 15% restocking fee and the cost of shipping the package both to the customer and returning to us. UPS & FedEx are available, please contact us before purchase. Return Policy: - We provide a FREE return within 30 days of delivery.- All return item(s) must be packaged in their original packaging.- Refunds cover the cost for the product only and do not include shipping charges.- All returns must open a return requet from eBay to generate a RMA number.- Without the RMA number, return will not be accept.- We reserve the right to decline any returns if the above guidelines are not followed.- If the package delivered shows visible damage as carrier delivery. Please send us a photo to show the damage and refuse the package.